Project Daedalus did a good job at showing both the strengths and the weaknesses of the series as Admiral Cornwell joined the crew of the Discovery for a daring raid against Section 31. It was an exciting, high-stakes episode that continued to elaborate on the rival politics between the organisations. It was a shame that Cornwell mainly served a purpose to provide exposition to the crew of the Discovery and existing primarily to move the plot further, and as a result of this I'm kind of hoping that she gets more to do going forward, because that directly leads us onto the next criticism that I'd like to mention here, and it's a common one. The series isn't doing enough to flesh out its ensemble cast. 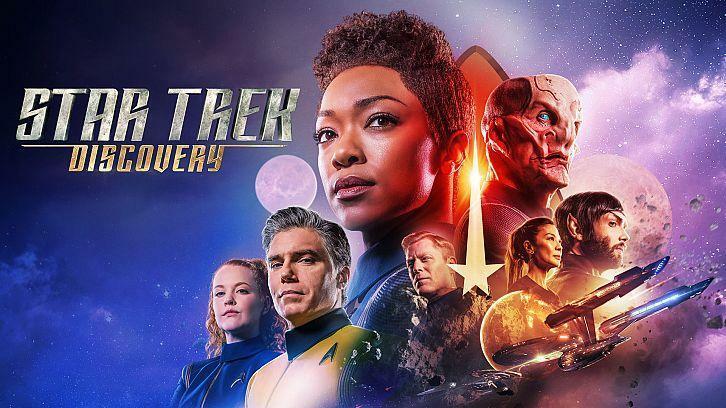 With most of the attention focused on Michael, Pike and Spock it means that the rest of the cast are getting left to the wayside aside from the occasional spotlight on Tilly, Culber, Stamets or Saru we don't really get much else. Sure, Owosekun joined an away mission earlier in the season for the memorable New Eden, but was given little to do on that mission. Most of it has been kept to the one-shot accompanying shorts, and as a result, writer Michelle Paradise, working with director Jonathan Frakes, has a lot of catching up to do on establishing the friendship between the cast. It's interesting to see the dynamic that the cast has, and hopefully the series will - having established further that the close bond between them, continue to do so in the future. Airiam was compromised here by the Red Angel in an earlier episode and now we get to see what happens when she goes rogue, pitted against Burnham and Commander Nhan in the episode's climax. Although it was late, and perhaps too late, the development of the bridge crew as friends and the fleshing out of Airiam's character through her memories did make the climatic scenes of this episode all the more memorable, and they certainly had an emotional impact with the character being airlocked into space, Battlestar Galactica style, before the Red Angel could use Airiam to gain information on the mysterious Starfleet AI Control, which has been mentioned before on the show but it's the first it's played a major role and that role only looks set to get bigger. It was interesting to see that Airiam was doing her best to fight the influence of the Red Angel but couldn't do anything about it in the end, especially when she tried to warn Tilly. There's enough up with Airiam for security chief Nham to notice that something is eventually wrong with her when the pair get into a fight, and Airiam holds nothing back. The ensuing fight sequence was appropriately chaotic and filled with plenty of tension, with Nhan's breathing device being ripped off her face. Talk about a high stakes conflict. Project Daedalus eventually was revealed with greater connection to Burnham than first thought and further implements her involvement in the Red Angel's identity. Could a future version of her be the Red Angel? It seems that it could be. The answers are getting ever closer, with the next episode appropriately titled, "The Red Angel", suggesting a foreboding upcoming encounter. The series has done a good job at course-correcting the mystery and even though it hasn't been perfect, I care a lot more about finding out who the identity of the Angel is than I did at the start of the season. Michelle Paradise was recently announced as the showrunner of Season 3 and although there were some weak links in this episode she does a good job of building suspense the stakes high and the tension throughout, hitting the emotional moments so effectively that by the end of the episode you almost forgot that Airiam was previously only someone who was a little more than a background character. Project Daedalus almost makes you think that she's been part of the series all along. And so the stage is set, with the hour concludes on a very exciting note. Sure, the episode may be flawed, but that doesn't stop it from being anotherwise solid hour and another strong episode with several important plot developments happening throughout. And based on the teaser for the next episode, the stakes are only about to get even higher.